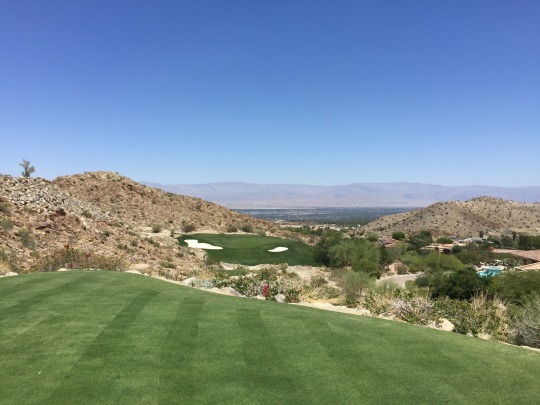 Last year, I was blown away by my experience at Bighorn Golf Club in Palm Desert. 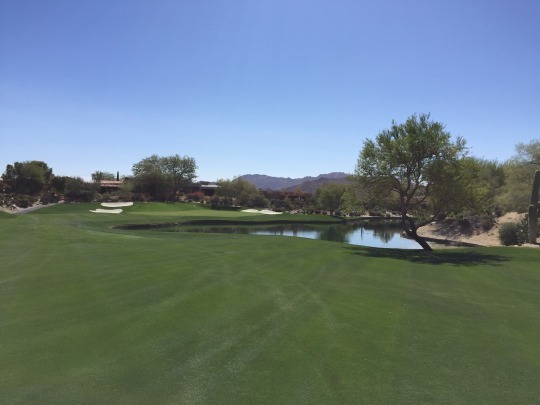 I had played in an SCGA outing and the round on The Canyons course there represented my 750th course played. 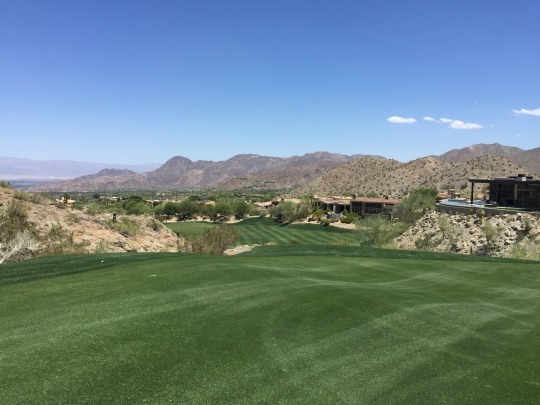 What’s funny is that my round this year on The Mountains course would have been number 850 if not for a last-minute 36-hole arrangement the day before at Toscana CC. This was another SCGA member outing. 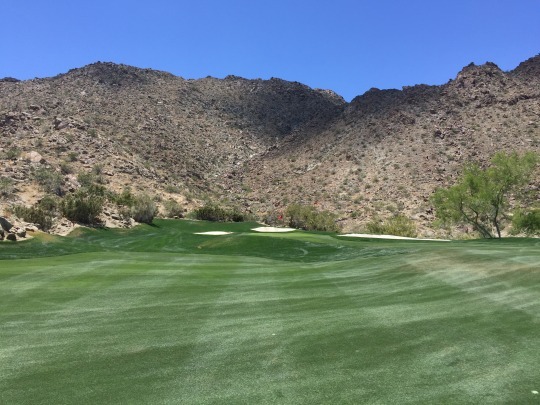 They visit Bighorn every year, but rounds on The Mountains course don’t come up as often as the ones on The Canyons. 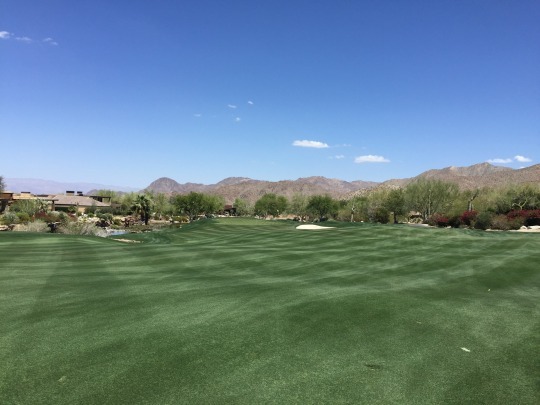 After last year’s experience, I have been waiting the past 12 months to play the other course at this amazing golf complex. We were hoping that the gigantic new clubhouse might be finished by the time this year’s outing happened, but construction is not set to be completed until this fall. That said, we did get a bit of a sneak preview of the site while playing Mountains. 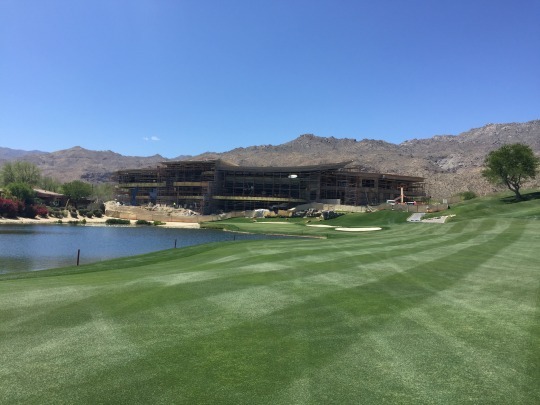 It will certainly be impressive once it’s finished, and it sits overlooking the 18th hole of Mountains, which is the original course at Bighorn. 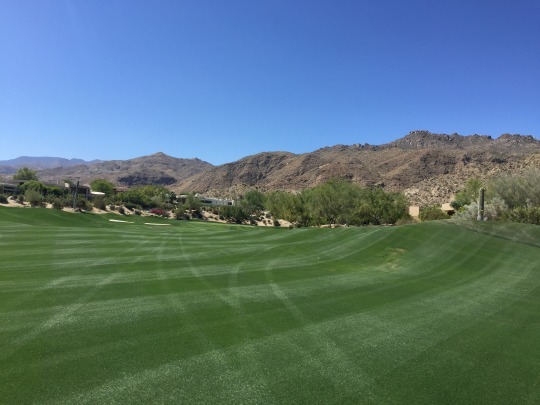 Ultimately, both courses will have their own driving ranges and practice areas. The Mountains course was designed by Arthur Hills. I was looking forward to checking it out. 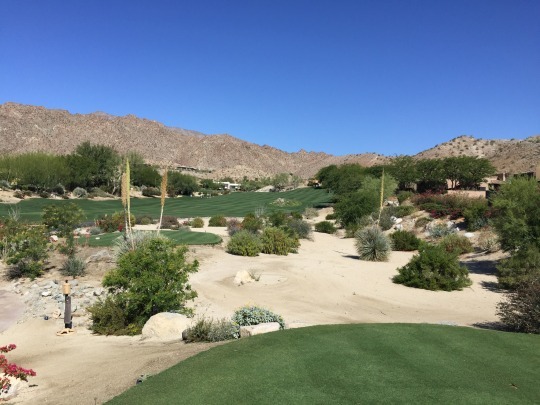 I loved The Canyons course so much and had heard that The Mountains was a more dramatic, target-oriented design. That’s usually my style, and any course with “mountain” in the name automatically piques my interest because I love big changes in elevation! My group started in the shotgun on the 10th hole. 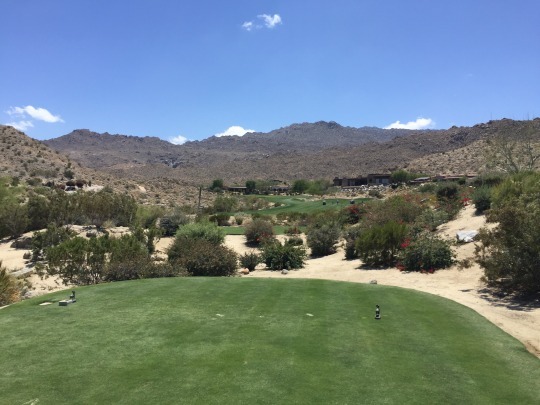 As we played the back nine, I honestly felt a tad underwhelmed. It was beautiful, enjoyable, challenging and interesting, but didn’t strike me as that dramatic in comparison with the other course. And though the mountains were always in view, there weren’t many big changes in elevation. The tee shots on the 11th and 12th holes are pretty elevated and cool, I must admit. 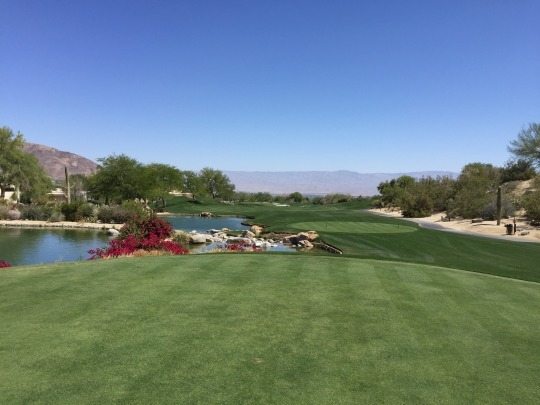 Then, we made the turn to the front nine and my expectations were met in abundance. This side offers more of what I was looking for. 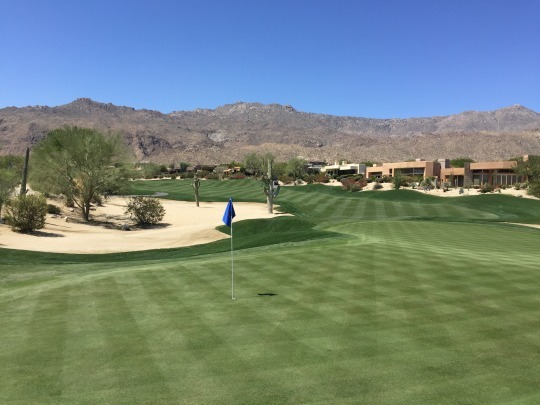 It is tight, extremely hilly, and definitely target style golf as it plays up along the mountain more intimately. Needless to say, I loved it. It made me wonder if the nines were switched at some point because this side felt like it should be the natural back nine. I asked our forecaddie and he said the nines were switched. He wasn’t sure exactly when, though. I would guess the reason for this is the positioning of the new clubhouse overlooking was is now the 18th green, so that makes sense. In the end, I was actually glad we started on the 10th hole because I felt like we experienced the proper routing. 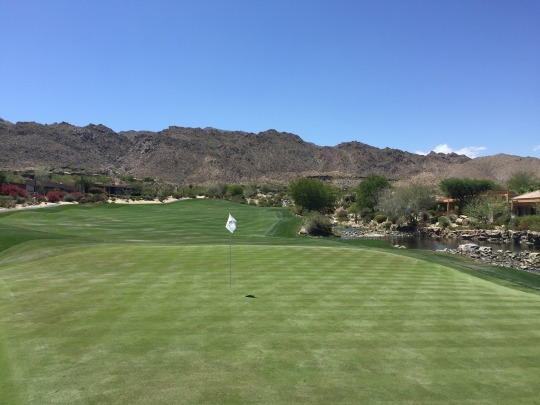 There are many memorable holes on The Mountains course. 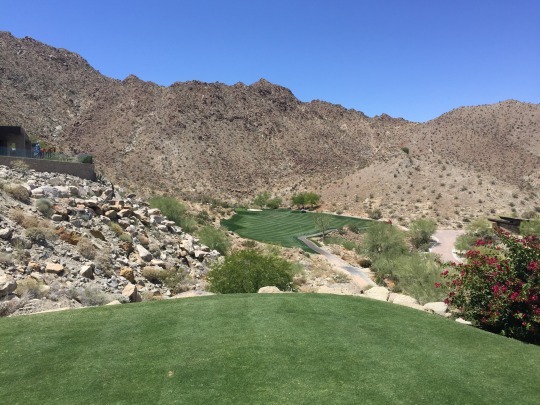 On the front nine, the 2nd hole probably struck me as the quirkiest with a big dogleg left that features a downhill tee shot to the corner and then a semi-blind uphill shot to the green with a nasty false front. 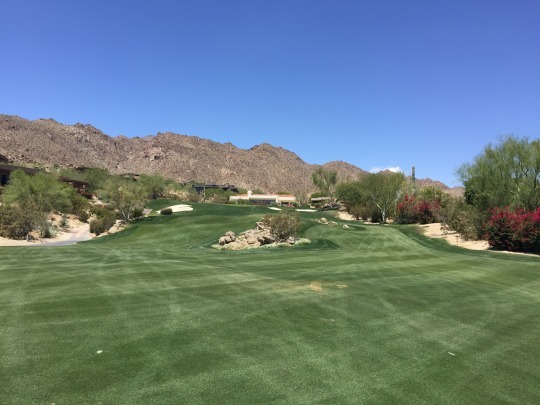 If you were starting on the current hole number 1, this 2nd hole would definitely throw you right into the the fire. 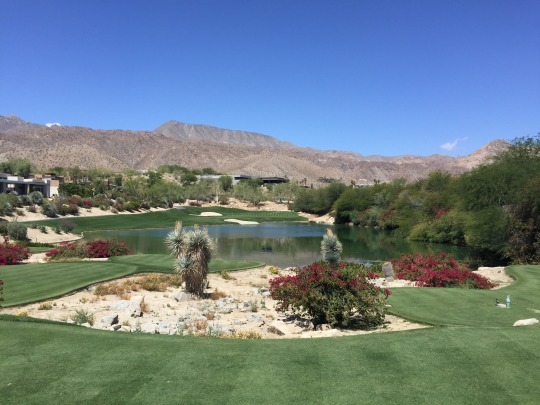 I particularly enjoyed the 6th hole, which is a really long par-4 (505 yards from the tips and 469 from the blue/member tees, which we were playing). However, it is straight downhill all the way and doesn’t play nearly that long. 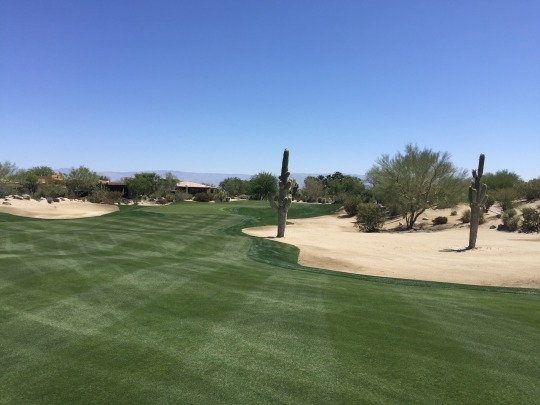 In fact, long hitters may have to use less than driver on the tee shot because you can run out of fairway. Then, you have a demanding shot to the green on the other side of a big ravine. 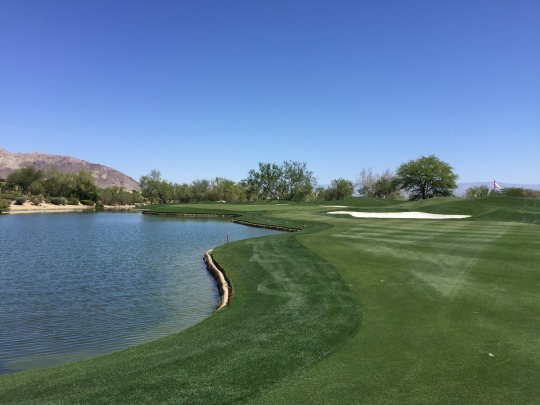 On the back nine, the 17th jumps out as a signature par-3 over the water. It is a gorgeous little hole. 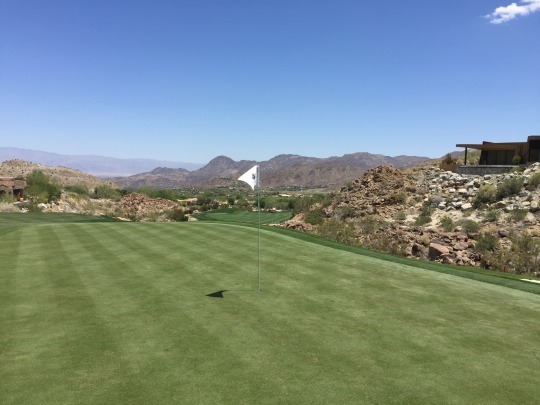 Like on Canyons, the landscaping and desert elements utilized throughout The Mountains course are breathtaking. 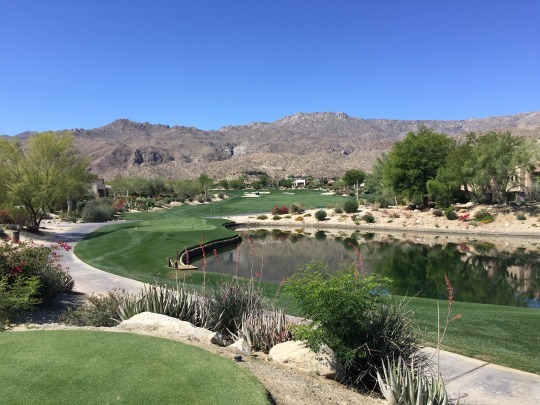 Then, you have some ridiculously nice homes surrounding the course and peppered along the rugged mountainside. Conditions were exceptional as expected. It maybe didn’t seem quite as immaculate as Canyons last year, but that set the bar pretty much at perfection. Still, by any measures this place was impeccably conditioned. 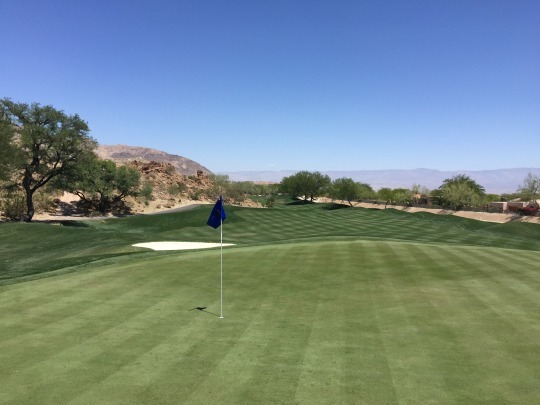 Bighorn is one of the top private clubs in the valley and it’s easy to understand why. 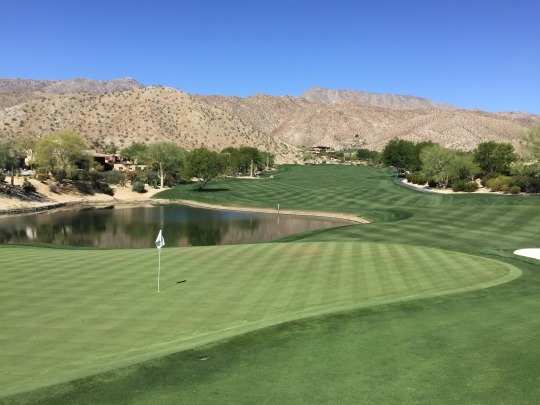 It is so great that they invite the SCGA members to come out every year and get a small taste of such a high-end golf experience. I hope I have a chance to come back in the future and see the new clubhouse and facilities when they are finally complete. 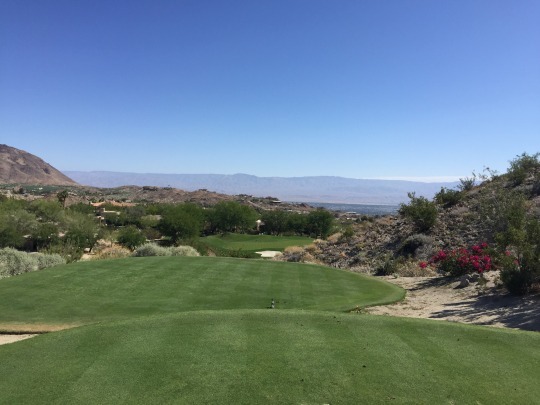 It may be awhile, though, because these outings don’t come cheap and my priority will always be on playing new courses in the area. 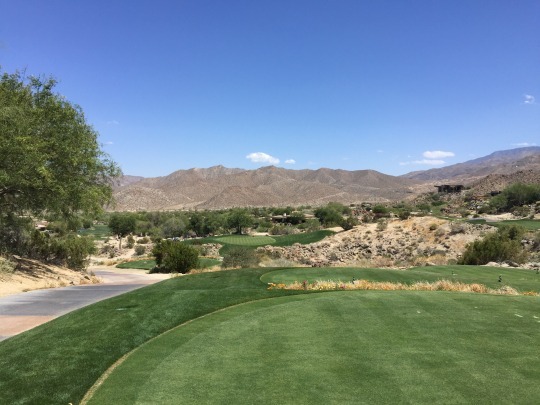 If I could only choose one nine to play again at Bighorn, it would be the front of Mountains. 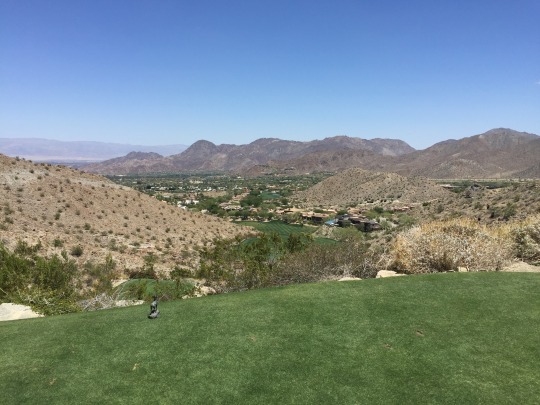 If I could only choose one full course, though, I would probably lean slightly toward Canyons overall. It would be a tough choice, as you can’t go wrong with either of these beauties.